Gearbox Software, the team developing Aliens: Colonial Marines recently spoke to Kotaku about how the Wii U version of the game would take full advantage of what the console’s controller can do. Randy Pitchford of Gearbox Software talked about three ways that the Aliens’ game would be using the Wii U’s new controller. First of all the entire game can be played on the device with the TV off. Which means you could pretty much play through the entire game without seeing it on the TV. Secondly, (and my favourite use) the controller will be used as a motion tracker, a device from the Alien series that can track the location of friends and enemies from their movement. Players might be asked to do a ‘sweep’ of the area which will involve them moving the controller around them to search for enemies which will show up as blips on the controller’s screen. Next up, the Wii U controller screen can act as a fully interactive map that will allow players to play through areas with a map of the surrounding area. And finally, the device will sometimes be used in minigames to unlock doors. It’s good to see that developers are really thinking hard about how they can use the controller to enhance gameplay. The game is still in prototype stage at the moment so I wouldn’t be suprised to hear more ways that the Aliens’ game will be using the Wii U’s unique features. 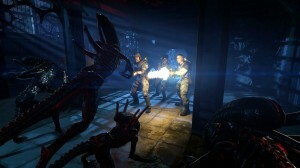 So what do you think about how Aliens: Colonial Marines will be using the Wii U’s controller? Using the U-Mote as the motion sensor in an aliens game was one the first things I thought about and how cool that would be. I will be buying this game for sure. i aint twin sticking core games YOU BETTER UNDERSTAND THAT DEVELOPERS !!!!!!!!! These are some brilliant ideas, the Wii U games are shaping up nicely.